Vintage hotel advertising postcards are a fun specialisation for postcard collectors as they really seem to sum up the fashions of the day so beautifully – the advertising blurb on the back of the card will be sure to list all the mod cons, whilst the image often shows not only the hotel, but local sites too. 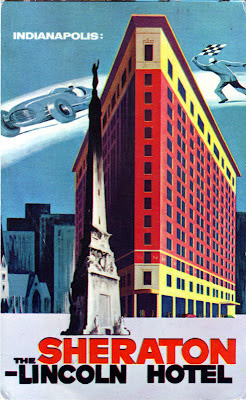 This Plastichrome postcard printed by major Boston publisher Colourpicture (active 1938-1969) featuring the Sheraton-Lincoln Hotel in Indianapolis is a classic: all the Indianapolis landmarks are there – the downtown skyline, the 284-foot Soldiers and Sailors' Monument, and of course, the Indianapolis Motor Speedway illustrated by a wonderful 1950s racing car - whilst the reverse of the postcard promises “Free Sheraton Hotel Reservations” via the quaint-sounding and today very nearly obsolete “Teletype”. The hotel itself, however, is the star of the show. Formerly known as simply the Hotel Lincoln, it was built in 1917-1918 by Chicago-school architects Rubush & Hunter, and was situated at 2 Kentucky Avenue. The tallest flatiron building ever built in Indianapolis, it was sadly demolished in 1973 to make way for the Hyatt Regency Indianapolis/PNC Center. For comfort, convenience and sincere hospitality it's Sheraton-Lincoln – in the heart of Indianapolis. Each room has private bath, television, radio and circulating ice water. Air-conditioned guest rooms in season. 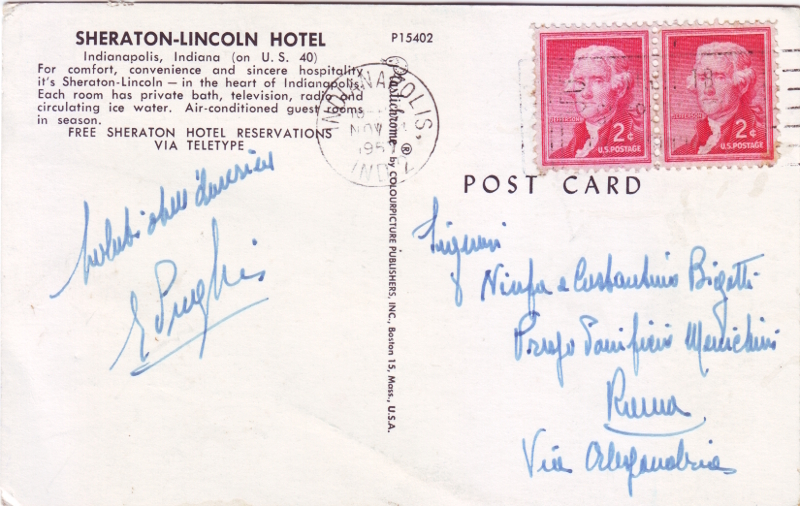 The postcard is rather flimsy and was probably issued as part of a picture booklet as the top edge has been cut in a way that accidentally includes a little of the following image. The print is a little off-kilter too, but this doesn't detract from the boldly stylish design. 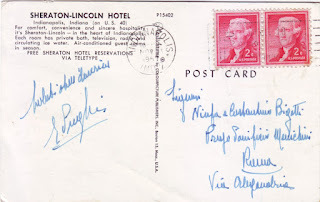 Posted in November 1957 it carries a lovely joined pair of 2 cent Thomas Jefferson postage stamps. 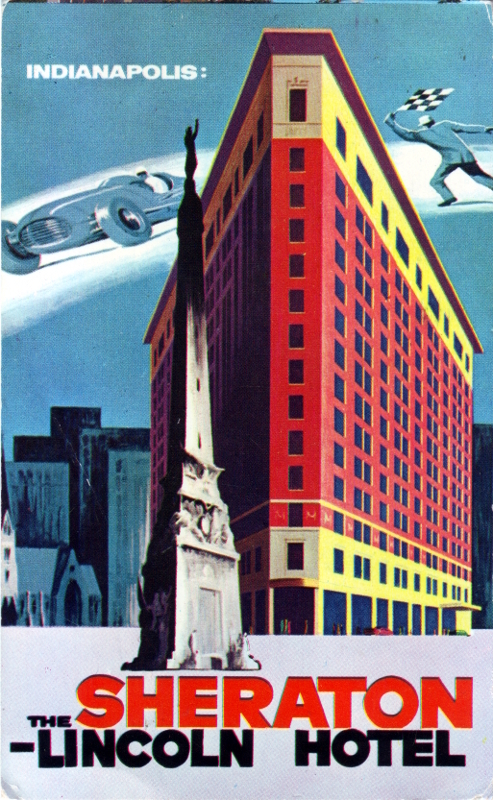 A great memento of a lost architectural gem.